One of the greatest critiques of tactical strategies is their ability to be “whipsawed” — bad timing decisions that leads to performance bleed due to overweight positions in underperforming assets. These events are often easy to pick out and easy to criticize as failures. Consider Stadion’s Managed Portfolio: they’ve had a number of whipsaw events — particularly in 2010-2011 that led to dramatic underperformance of the S&P 500. In my opinion, investors unfairly criticize such events, viewing the relative underperformance as a one-off cost. I take a different view: whipsaw is the “insurance premium” paid by tactical strategies to allow for the capital protection (see Stadion in 2008, for example). While the “payment” tends to come in large, lump sums, we should consider the cost over full market cycles. In that way, we can create an apples-to-apples comparison to other methodologies for protecting capital — such as the options (or “insurance”) market. So how much would protection cost us in the options market? As a simple evaluation method, I put together a 60/40 SPY/AGG portfolio and buy different levels of VXX — the short-term VIX futures ETN. Technically, buying VXX is buying volatility protection — but I think it serves as a good enough “tail hedge” for this simple evaluation. The strategies are rebalanced monthly. We can see the equity curves below. What we see is dramatic performance and protection differences between the different allocation levels. The protection during the bear market is graphed below: But how much does this protection cost us? To evaluate the implicit insurance premium we are paying, we compute performance drag from 2010 – Present versus the benchmark 60/40. We leave out 2008 and 2009 because we consider them to be anomalous markets where the insurance was realized. What we are trying to measure is the annualized cost in normal markets if the insurance is not exercised. Therefore, we leave those years out. Put in this light, the “whipsaw” costs of Stadion do not seem that bad. 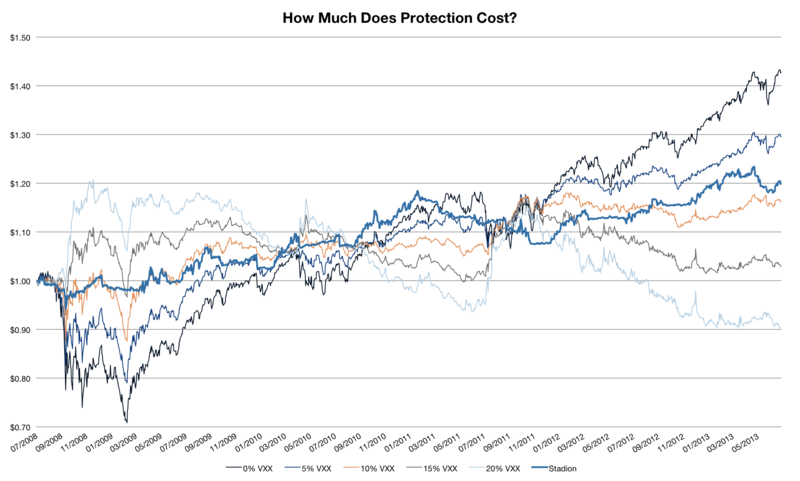 Protection similar to a 15% VXX position with close to only half the performance drag. Now, the strict difference here is that when insurance is actually purchased, it is guaranteed to protect. With Stadion, there is an extra risk premium that we should consider, since there is no guarantee that the tactical risk management will work. On the other hand, when buying options, you typically buy out-of-the-money puts (and potentially sell calls to help finance). Depending on how the market trends, the insurance may never be triggered and we could still be left with a huge loss. For example, consider buying 2.5% OTM puts every month, and having the market go down 2.49% every month. Not only do we pay the cost of insurance that we never get to exercise, but we rack up a 26% annual loss. Everything has its risks. Too often strategies are evaluated on a year-by-year, event-by-event basis. If we take a step back, consider their purpose, and compare them to other available options in the market, we can create an objective measure that serves as a better benchmark in evaluating strategy performance. Note: I have no affiliation with Stadion Money Management or Stadion Funds. This post is not meant as a recommendation for any of their products. The discussion contained within is purely for educational and informational purposes only.